Slow cooker meals are a life-saver during the holidays. I have so much going on with work, shopping and baking that I don't have time to fuss with dinner most nights. These Spicy Chipotle Short Ribs are a great weeknight meal. Just dump everything in the crockpot, and dinner is ready and waiting when you get home. The meat is kind of spicy. You can adjust the spice by adding more or less chipotles. I used one can for 3 pounds of beef. I served the short ribs two ways. 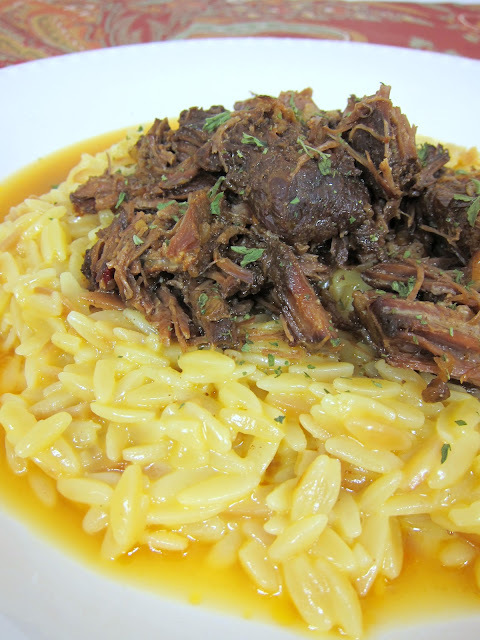 The first night we had the short ribs over some cheddar orzo. It was delicious! The second night we had Spicy Chipotle Short Rib Sliders. I can't decide which way I liked best. You can't go wrong with either one. Put everything in the crockpot and cook on low for 8 hours. Heat oil in a large saucepan over medium heat and add orzo. Cook, stirring constantly, until lightly browned. Stir in garlic powder and chicken broth; bring to a boil. Reduce heat to low, cover and simmer for 15 to 20 minutes. Stir in grated cheese. I really like orzo, need to get some more of it. The ribs look fall apart good. The meat sounds delicious and I like it over pasta rather than rice. That's nice. Who is talking about rice though? Orzo is pasta. Ohh Miss Steph, you shole duz have some purdy shote reyubs ! This looks delicious, except I'm not a fan of coke or pop in general. Does the flavor come out in the ribs? Is here something I can use in its place? For the minced onion -- do you use fresh or the dried, jarred kind? The sliders, both rock, but definitely the sliders. What size can chipotles in adobo sauce?